Cook pasta in plenty of salted boiling water, according to package instructions, for approx. 10 – 12 min. until al dente. Drain, save some pasta water, and set aside. Peel onion and garlic cloves and chop finely. Dice eggplant into cubes. Heat up some olive oil in a large frying pan and sauté onion and garlic for about 2 – 4 min. until translucent. Add eggplant to pan and fry for approx. 6 – 8 min. until browned on all sides and somewhat soft. Add whole peeled tomatoes and thyme leaves. Boil everything over medium heat for about 5 – 8 min. Season generously with salt and pepper. 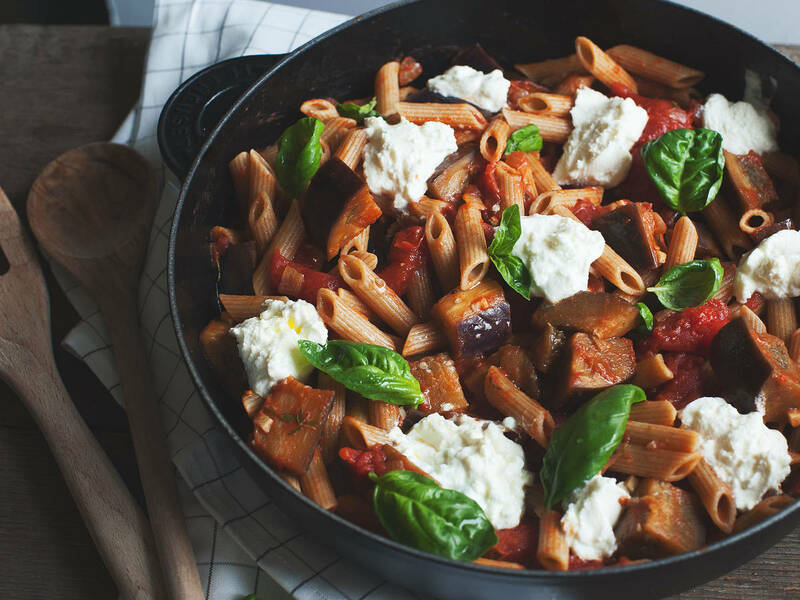 Toss cooked pasta in the sauce, add saved pasta water, and serve in deep plates with a dollop of ricotta and fresh basil.